One year on - PMRA in new territory? Time to get involved! With a general meeting coming up on February 8th it might be useful to look back twelve months to the one we held a year ago on January 27th 2016. Charlotte Levey came from Haringey’s Neighbourhood Action Team to talk about the plans for the council to link up with local residents groups through Team Noel Park. We drew up TEN points from that discussion. Here’s an up-date from John Miles who has attended all the Team Noel Park meetings on behalf of PMRA. First, we said we wanted a community clean-up - this took place on Saturday, October 15th and it has had an impact. There is less rubbish dumped in front yards and gardens. Our poster campaign with the council looked good - most of the placards are still in place giving vital information on reporting nuisance and disposing of bulky items. Second, we wanted improved street-lighting in Alexandra Road - that hasn’t happened although we contributed to the pressure to get the lights repaired in the alley beside the library. Third, we called for better security in Martin’s Walk. The police and the Council’s Safer Neighbourhoods Team came and discussed this with us at Team Noel Park. There’s some progress - the aggressive drinkers have been moved on, the alley is kept rather cleaner, and we’ve upgraded our garden fence and repainted parts of the mural. Discussions with the council continue. 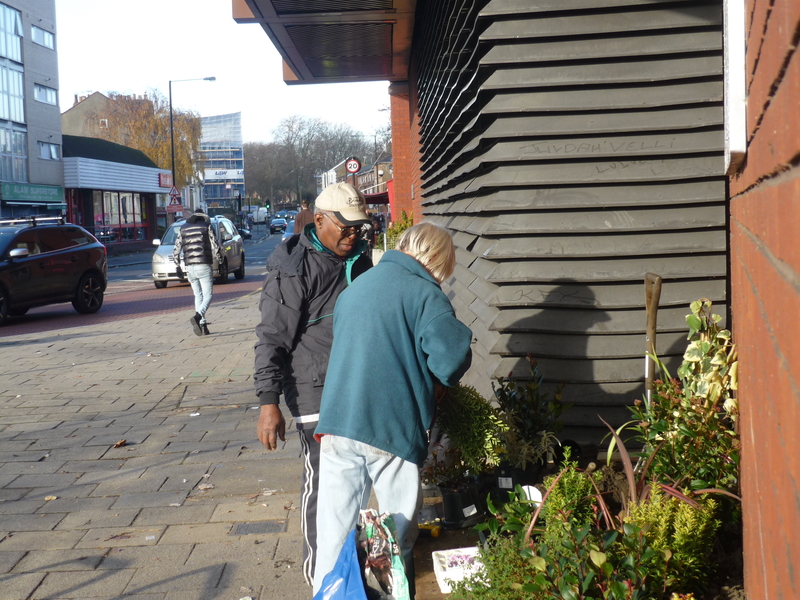 Our community gardening remains a key part of making the area safe. Fourth, we wanted improved street-cleaning. On the plus side there is less fly-tipping, people report dumps quicker, and nine times out of ten Veolia pick stuff up immediately. In the autumn we challenged the council on the actual sweeping of the streets, and of the alleys and Hornsey Park Road in particular. Although Veolia disputed our evidence their service improved considerably in the weeks before Christmas, even in the often neglected Arnold Bennett Way. The position on pavement repair - our fifth concern - has been very disappointing. 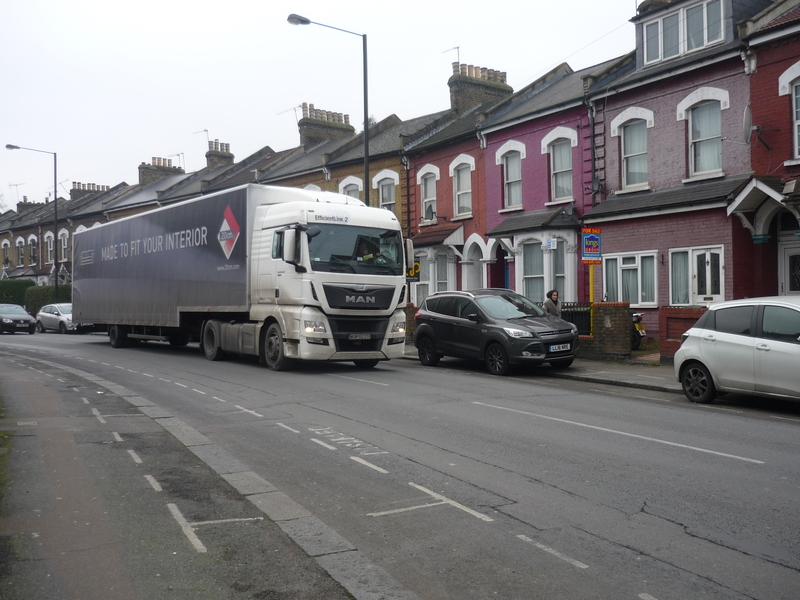 Various holes in Hornsey Park Road were marked up in the summer but nothing has been done: parts of the street are in a dreadful and increasingly dangerous state. Residents could help here by making individual reports and complaints - very few are received. Encouragingly, we heard before Christmas that repairs are imminent. Let’s see - and respond strongly if it doesn’t happen. 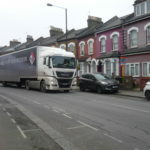 Our sixth point a year ago - something we’ve had on the agenda for years - was action on Hornsey Park Road, the road layout and traffic management. 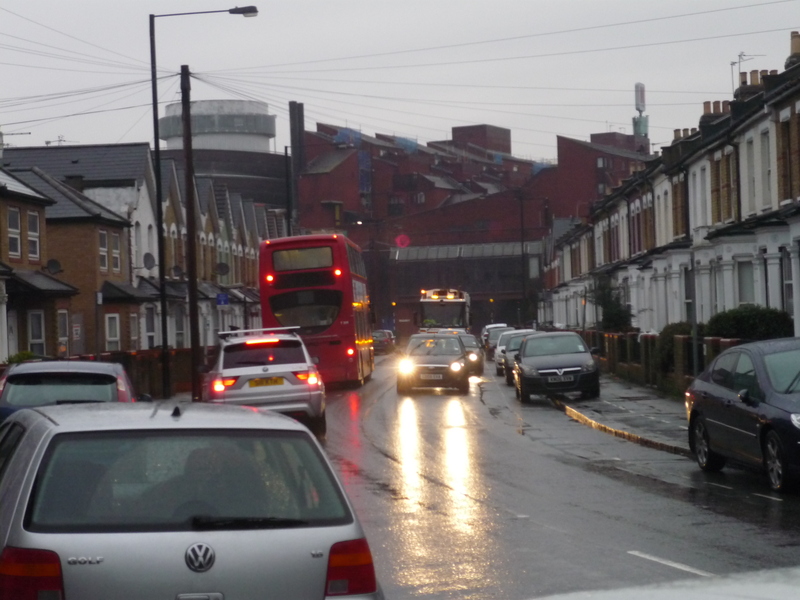 The misuse of the street by off-duty buses has regressed a little following the disruption of the Wightman Road closure. What’s on offer through the Community Streets programme is limited but worthwhile - a good turnout for the discussion with Gary Smith next Wednesday will help. We've made no progress on our seventh point - for better signage in the area. We should try to make progress with a second notice-board, down outside the doctor’s at the southern end of Hornsey Park Road, close to our proposed 'gateway' to the neighbourhood. 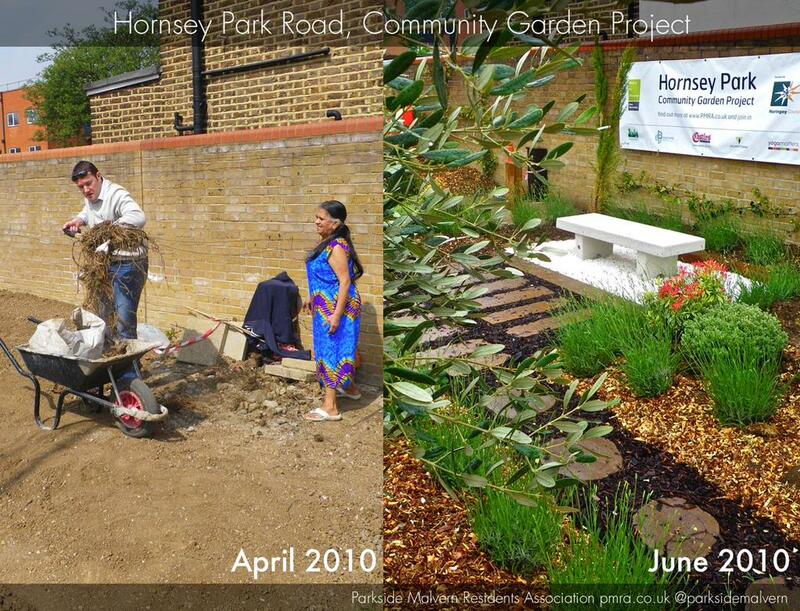 Our eighth point was to pursue the Hornsey Pocket Park as part of the Heartlands. Representatives of St William (the developers) came to our open morning under the lime-trees in May. Although the dialogue has developed more slowly than we hoped we are now confident that by the time it’s finished the Heartlands will bring much needed open space to the neighbourhood. Moreover, St William have shown real concern that their plans and designs should reflect the area’s industrial heritage, and enhance its biodiversity (but without unfortunately going so far as to promise to deculvert the Moselle!) They have been prepared to accept criticism and to consider alternative suggestions - and have persuaded National Grid to harmonise the remaining gas service feature on the site (a Pressure Reduction Station) within their overall design. Our ninth point was to pursue investment for our community gardening. Here we’ve been helped with funds from Haringey through the Noel Park Ward budget, a gift from Electoral Reform Services, and by consistent support from the Mall, who offer us storage space, funds for materials and projects, and constant encouragement. 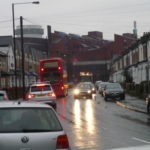 This relationship is topical because the recently published Wood Green Action Plan (AAP) envisages the future destruction of both the ‘shopping city’ and the social housing integrated within it. We think most Hornsey Park residents would rather see The Mall refurbished to encourage new investment by retailers (with the current housing retained and improved) as part of a modest, localised approach to regeneration. If so, now would be a good time to tell Haringey what we think. And the tenth point? That was to be about caring for and supporting each other. Ryan King attends Neighbourhood Watch. Sometime this year, following a good discussion last year at Team Noel Park with Haringey’s private sector housing team, we hope to make a new start with a meeting for private tenants and people living in multi-occupation. It’s time to get more involved! The Team Noel Park community conference has been rescheduled. It will probably take place on Saturday, March 11th 2017, at a venue yet to be decided. Look out for the newsletter.